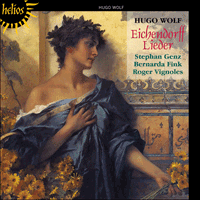 This important recording presents all of Hugo Wolf's settings of the poetry of Eichendorff—26 songs in all, several of which seem never to have been recorded before (a fact which is hard to understand because they are very attractive). One of Wolf's favourite writers, Joseph, Freiherr von Eichendorff (1788-1857) was the German Romantic poet par excellence and his poems are full of the sounds of nature, the beauty of landscape, religious faith, and much musical imagery, with references to minstrels and other musicians. He was the poet of Schumann's Op 39 Liederkreis, though perhaps the most well-known Eichendorff setting is Im Abendrot from Strauss's Four Last Songs. Wolf’s lieder are amongst the most absurd things so far produced by the extreme left wing of the New German School [the followers of Wagner], and have nothing in common with what I understand by ‘music’ except for the basic elements of sound and rhythm. Joseph, Freiherr von Eichendorff had always been one of Wolf’s favourite poets. There is a title-page in the Vienna City Library, probably dating from 1878, when Wolf was eighteen, that lists three Romanzen von J von Eichendorff (Der Kehraus, Das zerbrochene Ringlein and Der traurige Jäger), none of which has survived. Other early settings of his verse include a sketch for Verschwiegene Liebe, dating from 1879, whose vocal line bears no resemblance to that of the celebrated second version; and, from 1880, three songs—Erwartung, Die Nacht and Nachruf—the first two of which were included in the original Eichendorff-Lieder, but omitted from the second edition. The first of these, marked einfach und herzlich, is perhaps the most attractive of Wolf’s juvenilia; the falling thirds which accompany the voice accord well with the poem’s mood of gentle expectation, and though the harmonic texture is unmistakably Brahmsian, especially in the exultant postlude, there is something typically Wolfian about the inflec­tions in the vocal line. Die Nacht, too, with its hypnotic accom­paniment, anticipates Wolf’s later mastery in songs such as Nachtzauber, but his obvious debt to Schumann, most noti­ce­ably in the Zwielicht-like prelude, perhaps explains why he decided to omit the song from the second edition of the Eichendorff-Liederbuch—he had, after all, scribbled over the unfinished score of an early Chamisso song of 1878 ‘too much like Schumann’! Wolf next turned to Eichendorff’s poetry in April 1881 when, in the throes of breaking off his relationship with Vally Franck, he composed the six beautiful Geistliche Lieder to poems which deal with death, farewell and resignation to God’s will, among them Resignation (‘Komm, Trost der Welt, du stille Nacht’), that Schumann had set so wonderfully as Der Einsiedler. And in the summer of the same year he wrote In der Fremde I (‘Da fahr’ ich still im Wagen’), the first of three songs with the same title, and the only one which he, as a struggling Kapellmeister in Salzburg, composed in that gloomy year, des­cribed in Daten aus meinem Leben as ‘Bruch. Elend. Jammer’ (‘Break-up. Misery. Distress’). Once again, the influence of Schumann is evident. In der Fremde II was begun in February 1882 and finished in 1883, a year that saw the composition of five lieder, including In der Fremde III and Rückkehr. The theme of all these songs is the one familiar to us from Schumann’s celebrated Liederkreis, Op 39: the isolation and loneliness of a traveller returning home, unrecognized and unknown. At this early stage in his career Wolf was still tempted to select the type of Eichendorff poem that Schumann had set with such astonishing insight—the result, however, is hardly satisfac­tory, for though all three of these poems have lines almost identical to those in Schumann’s two In der Fremde songs, Wolf’s music, despite much beautiful detail, fails to crystallize and convince. Small wonder, then, that when in 1888 he decided to compose a complete Eichendorff cycle, he turned his back on the themes of nostalgia and loneliness and concentrated instead on the picaresque gallery of soldiers, students, sailors and minstrels that had until then been ignored by all song composers of Eichendorff’s poetry. But 1888 was still four years hence. After the completion of In der Fremde III (30 January 1883) there followed a fallow period of almost four and a half years which began with the death of his idol Wagner in February 1883 and the rejection by Breitkopf & Härtel of a proposed volume of lieder. He was deeply depressed and compelled to eke out a living as a music critic, which left little time for composition. In these four bleak years only three songs were written, including Der Soldat II (14 December 1886), a theatrical tour de force that counsels a carpe diem attitude to life and depicts the onset of death in a succession of repeated phrases, whispered sepulchrally, as the song—Wolf’s shortest in duration?—pants to an ominous close. Nibelung’s anvils can be heard in the prelude and the whole atmosphere of the song reminds us of Wagner. Yet it is also wholly Wolfian in feel, and a wonderful example of what great lieder can accomplish—here, the reducing of an ope­ra­tic idea to its essence, a hint of things to come. The five songs which he composed to Eichendorff texts between March and May 1887 are of the same high artistic order, and again we glimpse the genius that is about to explode into song. In Der Soldat I, composed on 7 March, Wolf is clearly captivated by the prancing of the little horse that takes him to his beloved’s castle and, when she becomes too possessive and demanding, away into the open countryside and freedom—Eichendorff puns on the word ‘Freien’, which means both ‘wooing’ and ‘out in the open’. Exactly one year later, on 7 March 1888, Wolf was to create another unforgettable prancing motif in Mörike’s Der Gärtner. It is remarkable how in the Eichendorff song the little motif undergoes subtle changes: staccato and self-confident at the outset, lilting and tender at ‘Die mir besser gefällt’, and then robust and arrogant in the final verse as he abandons his fawning sweetheart. There is a striking resemblance between this music and Wolf’s Italian Serenade for string quartet com­posed two months later, which also owes its conception to Eichendorff, whose Novelle Aus dem Leben eines Taugenichts not only contains an Italian serenade but also a poem (Wer in die Fremde will wandern) that Wolf was to set in 1888 as Heimweh. Having completed Der Soldat I, Wolf set three Eichendorff poems, Die Kleine (8 March 1887), Die Zigeunerin (19 March) and Waldmädchen (20 April), all of which depict women as independent beings, in charge of their own destiny. Die Zigeunerin, with its deliciously flirtatious melismatic triplets, was included in the first edition of the Eichendorff-Lieder, which Wolf chose to end with Waldmädchen, whose virtuosic postlude, marked sehr schnell and in the final bars diminuendo (pp to pppp within four bars), he presumably regarded as a brilliant climax to his volume. Die Zigeunerin was retained in the second edition of 1898, while Waldmädchen was omitted by the composer, who by that time had written, in the Mörike volume, fairy music of incomparable delicacy. Die Kleine was not published during Wolf’s lifetime since Wolf clearly felt that the lubricious text might offend. The other Eichendorff setting of 1887 is Nachtzauber, marked sanft fliessend and steeped in the sort of romantic enchantment that had so appealed to Schumann. The whole song flows along hypnotically, with a swaying accompaniment that almost seems to anticipate Debussy. Written on 24 May, Nachtzauber was virtually the last work composed by Wolf that year. His father had died a fortnight before and he now fell prey to a creative paralysis that was broken only the following year by the eruption of Mörike songs that flowed from his pen between 22 Feb­ruary and 18 May. He then decided to postpone the completion of the Mörike-Lieder and finish instead the Eichendorff volume that he had begun, as we have seen, in 1880 with the composition of Erwartung and Die Nacht. The rate of composition was, once again, remarkable: in quick succession he wrote thirteen new songs between 31 August and 29 September, and no fewer than ten in the week from 22 to 29 September. In a letter to Engelbert Humperdinck, dated 12 March 1891, he made it clear that, following the current trend of realism (‘übereinstimmend mit der realistischen Kunst­richtung’), he wished to abandon the romantic element in Eichendorff’s poetry and turn instead to the comparatively unknown, the saucily humorous and robustly sensual side of the poet (‘der ziemlich unbekannten, keck humoristischen, derb-sinnlichen Seite des Dichters’). And a glance at Challier’s Grosser Lieder-Katalog tells us that he was the first lieder composer to have attended to this side of Eichendorff’s poetry. The songs are a delight. At the head of the published volume he placed Der Freund, a tribute to his friends (Eichendorff’s original poem was actually called ‘Die Freunde’) who had helped defray the cost of publication (Friedrich Eckstein) and had encouraged him through his depression (Edmund Lang and others, like Joseph and Friedrich Schalk, to whom the volume was dedicated). To make even clearer his indebtedness to such friends, he followed the opening song with Der Musikant, a sort of humorous self-portrait, with lute arpeggios in the accompaniment and a delicious modula­tion to a remote key at ‘Weiss nicht, wo ich abends ruh!’, which conveys the minstrel’s fear of spending the night without a roof over his head. Next comes Verschwiegene Liebe which, despite Wolf’s resolve to embrace realism, is the most romantic and Schumannesque song of the volume. The poem dates from 1855 and Eichendorff later incorporated it into his verse narrative Robert und Guiscard where it is sung by Guiscard who, standing at his open window in the moonlight, breathes in the scent of lilac, senses his sweetheart Marie nearby, and sings the song ‘from the depths of his heart’. ‘Errät’ es nur Eine, Wer an sie gedacht’ clearly refers to Marie, but Wolf was probably thinking of Melanie Köchert with whom he was already emotionally, and clandestinely, involved. The song, according to Wolf’s first bio­grapher Ernst Decsey, was composed in one single flash of inspiration. Wolf, with a book of Eichendorff poems in his hand, was walking up and down Friedrich Eckstein’s garden immersing himself in the mood of the poem. Unable to bear the noise of the nearby factory, and disturbed by whistling in the court­yard and the persistent sound of carpet-beating from another house, he turned about, entered the house, went up to Eckstein’s room, sat down at the piano, put the book of poems aside, and wrote out the complete song with hardly a pause for breath. Das Ständchen is a serenade quite unlike any other. The title refers to the song sung by a young student outside his sweetheart’s door, but we only hear his serenade as a lute accompaniment in the piano part as it plays snatches of melody and pizzicato notes in the right hand. Dolce is the crucial marking, for the young student is happy and in love. This contrasts with the sad utterances in the vocal line of the old man, who looks on distraught, as he is reminded of the happiness that he used to enjoy before his sweetheart died. He sings a sort of recitative, often on repeated notes, that never really coalesces into song, so that the contrast with the blithe serenader is made even more poignant; never, that is, until at ‘So in meinen jungen Tagen’, when the vocal line heart­breakingly echoes the lute-like accompaniment, reminding the old man of his own past happiness—an unforgettable moment that strikes to the heart. This masterpiece is followed by Der Soldat I, Der Soldat II, Die Zigeunerin and Nachtzauber that have already been discussed. Two swashbuckling songs, composed within three days of each other, come next: Der Schreckenberger and Der Glücksritter, characterized by rhythmic energy and enormous panache. Wolf obviously conceived them as a pair, since the processional theme at the end of the first setting, marked pompös and fff, is repeated in the postlude of the second. Der Schreckenberger, which appeared in Eichendorff’s Novelle Der Glücksritter, was inspired by the wildness of the Rettenbach region around Ischl, and Der Glücksritter was actually committed to manuscript paper as Wolf rode in a mail-coach to Rinnbach. Wolf’s heightened mood of creativity is also evident in the next two songs that were composed on the same day, 29 September. Lieber alles reviews the possibility of becoming a soldier, a student or a poet. Each profession is rejected in turn, for he wants to combine elements of all three—hence the title, which states that ‘he’d rather have them all’. And so he sets out on his horse with a sturdy sword at his side, a lute in his right hand, and a student’s heart within his breast that would duel with anyone. Wolf illustrates the quixotic nature of the young man in the quick succession of different motifs in the prelude, and conveys his distaste for each profession by clever musical means: the mention of soldiery is punctuated by a rest; the singer is instructed to slow down (‘zurückhaltend’) when he describes study; and to depict the prissiness of writing poetry, the pianist is given a succession of chirping semitones that twitter away ineffectually. Heimweh, with its walking rhythm, tuneful melody and wonderful setting of the word ‘weit’ (on a tied melisma over one-and-a-half bars, to show just how distant his sweetheart and homeland are) has always been one of Wolf’s most popu­lar Eichendorff settings, but not always for the right reasons. At one of the first performances of the Eichendorff-Lieder, on 7 February 1889, Wolf was accompanying Ferdinand Jäger in a performance of Heimweh in the Wagner-Verein when, after the phrase ‘Grüss dich, Deutschland, aus Herzensgrund!’, a roar of applause broke out among the ‘Grossdeutschen’ in the audience, drowning the postlude. Wolf was furious. He slammed down the piano lid and shouted vitriolically at the offending audience: ‘Und das im Wagner-Verein!’ (‘And in the Wagner-Verein of all places!’). The concert was interrupted and the ‘Grossdeutschen’ walked out. The same offending line occasioned another amusing anecdote, as Hermann Prey recalls in Premierenfieber. During the interval of a lieder recital with Alfred Brendel in Wiesbaden, Brendel, who had not warmed to the rather conservative audience, offered Prey fifty Marks if he dared change the last line of Heimweh to ‘Grüss dich, Sarah, aus Herzensgrund!’. Prey did not accept the challenge. The next two songs are sung by a student—content in Der Scholar, despairing in Der verzweifelte Liebhaber. The former is one of Wolf’s most delightful lieder. The student in question is content whatever he does: listening to the birds, the pattering rain or the flashing lightning. Nothing, he says, could deter him from wandering. Free from Mammon, he will roam the field of knowledge, think deeply and occasionally drink a glass or two of wine. And when he tires of such study he will serenade his sweetheart. While this sybaritic existence is conveyed by Wolf’s memorable melody for voice and right hand, the left hand is busy interpreting the text in other ways. The quavers are played staccato throughout the first verse, inspired no doubt by the mention of raindrops, and then legato in verse two to convey the idea of a ‘zufriedenes Gemüt’, a contented heart. They return again at the exciting idea of alcohol, but at ‘Rebensaft’, in other words when the wine has been quaffed, the pianist is instructed to play nicht stacc.—the mellowing effect of wine has already been felt! The final verse, which starts by describing the fatigue of work, has no need of staccato quavers either—until he decides to serenade his sweetheart and pluck the strings. The poem appears in Eichendorff’s Novelle Dichter und ihre Gesellen where in Chap­ter VI the hero Fortunat hears the first two verses sung by a troupe of minstrels who have been surprised by a thunder­storm; verses three and four are sung as they find shelter in a town. The student in Der verzweifelte Liebhaber expresses his despair in a succession of recitative phrases, interrupted by harsh chords: study earns him nothing, his coat’s unstitched, his zither’s broken and his sweetheart doesn’t love him. He then starts to fantasize, the quavers begin to flow, and he imagines himself walking through a meadow on the arm of the most beautiful lady. The music continues in tongue-in-cheek self-parody: disguised as a dragon (octave quavers), he carries her off and, equipped with armour and lance, puts all the philistines to rout and finally lies down contentedly (dotted minims played piano) beneath the sky. Unfall, a burlesque, perhaps, of Mozart’s Dans un bois solitaire, tells how the narrator, while going for a walk across country, meets a little boy with a gun in his hand. When he confronts the fellow, the little imp (Cupid in disguise) fires at him so that he falls flat on his face. Discovering the identity of his assailant, the narrator grows thoroughly indignant and cross. The little poem is an ideal vehicle for the Wolfian wit which the composer lavishes on us. The deadpan narration starts in ‘tragic’ D minor with square-cut phrases, until the narrator starts to run (quavers turn to triplet semiquavers) towards his attacker who fires his gun to the accompaniment of a sforzando dissonant seventh chord. As he falls to the ground the vocal line becomes fragmented and Cupid laughs at him in a flurry of triplet semiquavers. Liebesglück (the poem is called Der Glückliche in Eichendorff) describes the rapture that fills a lover’s heart when his sweetheart gazes on him. It is an exuberant and rhythmically vigorous song which needs a singer with consi­derable breath control and stamina to perform, and a pianist who does not wilt under the pressure of hammering out the dactylic rhythm in both hands. The collection ends with a farewell, Seemanns Abschied, yet another song that allows Wolf to display his gift for pictorial touches such as the pounding waves (bass octaves), the snapping of shark jaws, the scream of seagulls, and also his remarkable ability to conjure up atmosphere—a seascape reeking of tang and spray and redolent of lashing winds, that we hear in the very first bar of the boisterous prelude, which caused Bruckner, when Wolf showed him the song, to cry out in amazement: ‘Teufel! woher haben Sie den Akkord?’ (‘Where the devil did you get that chord from!’). Joseph, Freiherr von Eichendorff was born in 1788 on the family estate at Schloss Lubowitz in Silesia, and it was there that he spent an idyllic childhood surrounded by wooded mountains high above the Oder valley. He was educated by private tutors but later attended a Catholic school in Breslau, where he remained until 1805 when he and his devoted brother Wilhelm went to Halle University to study Law. In 1807 he moved to Heidelberg where he was much influenced by Arnim and Brentano’s Des Knaben Wunderhorn, a rich source of German Romantic folk-poems published between 1805 and 1808. Having left university, the brothers embarked on a Grand Tour which took in Paris, Nuremberg and Vienna before they returned home to help manage the declining family estate. By this time Eichendorff had already written his first poems, including such gems as In einem kühlen Grunde and O Täler weit, o Höhen’, that were soon to feature in every anthology of German poetry. While working on the family estate he fell in love with the daughter of a neighbouring landowner, Aloysia von Larisch, who later became his wife. In 1809 Eichendorff visited Berlin where he met Arnim, Brentano and Kleist, and the following year he moved to Vienna to study for his Civil Service exams and came into frequent contact with Friedrich Schlegel. In 1813, fired by Friedrich Wilhelm’s appeal to the Prussian people, he enlisted as a volunteer in the War of Liberation and stayed in the army till Napoleon’s defeat in 1815, the year which saw the publication of his first Novelle, Ahnung und Gegenwart, and his marriage to Aloysia, who bore him four children and lived with him till her death in 1855. From 1816 for the next twenty-eight years he held a number of positions in the Civil Service until his early retirement in 1844. He now withdrew from all public life, took no part in the 1848 revolution (which he bitterly criticized) devoted his time to literature and, when his wife fell ill, moved to Neisse to live with his daughter’s family. After Aloysia’s death he began to write his memoirs, but fell ill in early November 1857 with a cold which finally led to pneumonia. He died on 26 November at about five in the morning, without a struggle, and was buried four days later by the side of his wife. Eichendorff’s verse is to a quite unusual degree musical, which probably accounts for the astonishing frequency with which composers have set his poetry. According to Fischer-Dieskau in his Töne sprechen, Worte klingen, the final sixty-seven years of the nineteenth century produced well over five thousand Eichendorff settings. His poems—unlike those of Goethe who was more an ‘Augenmensch’—are peppered with references to horns, bells, lutes, mandolins and other musical instruments; and no other German poet wrote so many poems about minstrels, musicians or the sounds of nature. Two themes predominate: beauty of landscape and religious faith. The beauty of God is manifested in nature, and Eichendorff—although, unlike the early Romantic writers, he never theorized about his ideas—attempted in his verse to free man’s spirit from the tedious routine of everyday life. Many of his poems (and there are over five hundred) are variations on these themes, but his range is wider than is usually believed. He grouped his poems into eight sections: Wanderlieder, Sänger­leben, Zeitlieder, Frühling und Liebe, Totenopfer, Geistliche Gedichte, Romanzen and Aus dem Spanischen; and Wolf, with a predilection for the picaresque and vignettes of eccentrics, chose poems from all of them except Aus dem Spanischen. Eichendorff’s dual existence as Romantic poet par excel­lence and efficient bureaucrat is as incongruous a com­bination as Kafka the insurance man, or Keller the clerk to the Canton of Zürich. His best known Novelle, Aus dem Leben eines Taugenichts (‘From the life of a good-for-nothing’), which was published in 1826, can be interpreted as the wishful dream of a conscientious civil servant; and many of his finest poems were written in towns such as Breslau and Berlin where he clearly longed for the countryside he loved so dearly. But Eichendorff was also aware of the darker side of life, and many of his poems, particularly those chosen by Schumann for his Liederkreis, Op 39, express fear of isolation and distrust of other human beings. His bleakest poetry was written shortly after the death of his youngest daughter Anna, who died aged seventeen months on 24 March 1832. From this shattering experience he managed to distil a cycle of ten poems which he called Auf meines Kindes Tod. Othmar Schoeck set Von fern die Uhren schlagen as part of his Opus 20, and Aribert Reimann concluded his Nachtstück II (1978) with Was ist mir denn so wehe? But, on the whole, these wonderful poems, which shift in mood from bitterness and sadness to accep­tance and, finally, a timid hope, have been sadly ignored by lieder composers. Les lieder de Wolf comptent parmi les choses les plus extravagantes produites à ce jour par l’extrême gauche de la nouvelle école allemande [les disciples de Wagner], et n’ont grosso modo rien de commun avec ma conception de la «musique», sinon les éléments fondamentaux du son et du rythme. Joseph, Freiherr von Eichendorff a toujours été l’un des poètes favoris de Wolf—une page de titre, conservée à la bibliothèque de Vienne et datant probablement de 1878 (Wolf avait alors dix-huit ans), énumère trois Romanzen von J von Eichendorff (Der Kehraus, Das zerbrochene Ringlein et Der traurige Jäger), toutes perdues. Parmi ses autres premières mises en musique de poèmes d’Eichendorff, citons une esquisse de Verschwiegene Liebe (1879), dont la ligne vocale ne ressemble en rien à celle de la célèbre seconde version, ainsi que les trois lieder Erwartung, Die Nacht et Nachruf (1880), dont les deux premiers furent inclus dans les Eichendorff-Lieder originels, mais omis dans la seconde édition. Erwartung, marqué einfach und herzlich, est peut-être le lied le plus attrayant de la jeunesse de Wolf; les tierces descendantes qui accompagnent la voix s’accordent bien à l’atmosphère de douce expectation du poème et, nonobstant une texture harmonique immanquablement brahmsienne, surtout dans le postlude exultant, les inflexions de la ligne vocale recèlent quelque chose de typiquement wolfien. Die Nacht, avec son accompagnement hypnotique, présage également la maîtrise wolfienne à venir (dans Nachtzauber, par exemple), mais sa dette évidente envers Schumann, surtout décelable dans le prélude de type Zwielicht, explique peut-être pourquoi Wolf décida de ne pas l’inclure dans la seconde édition de l’Eichendorff-Liederbuch—après tout, n’avait-il pas griffonné sur la partition inachevée d’un lied de Chamisso (1878): «trop schumannesque»! Wolf se tourna à nouveau vers la poésie d’Eichendorff en avril 1881, lorsqu’il composa, en pleine rupture de sa relation avec Vally Franck, les six magnifiques Geistliche Lieder, sur des poèmes abordant la mort, les adieux et la résignation à la volonté de Dieu, parmi lesquels Resignation («Komm, Trost der Welt, du stille Nacht»), déjà si merveilleusement mis en musique par Schumann sous le titre Der Einsiedler. Au cours de l’été 1881, Wolf écrivit In der Fremde I («Da fahr’ ich still im Wagen»), le premier de trois lieder du même titre, et le seul composé en cette année sombre—il était alors Kappel­meister à Salzbourg et tirait le diable par la queue—, qualifiée de «Bruch. Elend. Jammer» («Rupture. Misère. Détresse») dans Daten aus meinem Leben. Une fois encore, l’influence de Schumann est évidente. In der Fremde II fut entrepris en février 1882 et achevé en 1883, année qui vit la composition de cinq lieder, dont In der Fremde III et Rückkehr. Le thème de tous ces lieder nous est familier grâce au célèbre Liederkreis, op.39 de Schumann, sur des poèmes d’Eichendorff: l’isolement et la solitude du voyageur de retour chez lui, anonyme et inconnu. À ce stade précoce de sa carrière, Wolf était encore tenté de choisir le type de poèmes d’Eichendorff déjà mis en musique par Schumann, avec une pénétration si surprenante—mais le résultat n’est guère satisfaisant car, bien que les trois poèmes présentent des lignes quasiment identiques à celles des deux lieder schumanniens In der Fremde, la musique de Wolf ne parvient, malgré force détails magnifiques, ni à cristalliser ni à convaincre. Guère étonnant, dès lors, qu’il décidât de composer, en 1888, un cycle complet d’après des poèmes d’Eichendorff en tournant le dos aux thèmes de la nostalgie et de la solitude pour se concentrer sur la galerie picaresque des soldats, étudiants, marins et ménestrels, ignorés jusqu’alors par tous les compositeurs de lieder d’Eichendorff. Mais quatre années le séparaient encore de 1888. L’achèvement de In der Fremde III (30 janvier 1883) fut suivi d’une période de presque quatre ans et demi d’improductivité, déclenchée par la mort de son idole, Wagner, en février 1883, puis par le rejet d’un volume de lieder par Breitkopf & Härtel. Profondément déprimé, il gagna tout juste sa vie comme critique musical, ce qui lui laissa peu de temps pour la composition. Durant ces quatre années sinistres, il n’écrivit que trois lieder, dont Der Soldat II (14 décembre 1886), tour de force théâtral qui prône une attitude carpe diem envers la vie et dépeint l’assaut de la mort dans une succession de phrases répétées, murmurées lugubrement, à mesure que le lied—le plus court de Wolf?—halète jusqu’à une fin sinistre. Les enclumes du Nibelung sont audibles dans le prélude, et toute l’atmosphère du lied nous rappelle Wagner. Elle n’en est pas moins pleinement wolfienne, merveilleux parangon de ce que les grands lieder peuvent accomplir—la réduction d’une idée opératique à son essence même, allusion aux surprenantes choses à venir. Les cinq lieder composés sur des textes d’Eichendorff entre mars et mai 1887 présentent la même élévation artistique, qui nous laisse entrevoir le génie sur le point d’exploser. Dans Der Soldat I, écrit le 7 mars, Wolf est manifestement captivé par les cabrioles du petit cheval qui l’emmène au château de sa bien-aimée, puis le remmène vers la rase campagne et la liberté, lorsque la jeune fille se fait trop possessive et exigeante. Eichendorff joue sur le mot «Freien», qui signifie à la fois «courtiser» et «en plein air». Exactement un an plus tard, le 7 mars 1888, Wolf créa un autre motif caracolant inoubliable dans Der Gärtner de Mörike. Il est remarquable de voir comment le petit motif du lied d’Eichendorff subit de subtils changements: staccato et plein d’assurance au début, simple et tendre aux mots «Die mir besser gefällt», puis robuste et arrogant dans la strophe finale, lors de l’abandon de l’amoureuse flagorneuse. Cette musique ressemble étonnamment à l’Italienische Serenade de Wolf, composée pour quatuor à cordes en mai 1888, qui doit également sa conception à Eichendorff, dont la nouvelle Aus dem Leben eines Taugenichts contient non seulement une sérénade italienne, mais un poème (Wer in die Fremde will wandern) mis en musique par Wolf, en 1888, sous le titre Heimweh. Der Soldat I achevé, Wolf mit en musique trois poèmes d’Eichendorff—Die Kleine (8 mars), Die Zigeunerin (19 mars) et Waldmädchen (20 avril)—, portraiturant tous les femmes comme des êtres indépendants, responsables de leur destinée. Die Zigeunerin, avec ses triolets mélismatiques délicieusement charmeurs, figura dans la première édition des Eichendorff-Lieder, que Wolf choisit de clore sur Waldmädchen, dont le postlude virtuose (marqué sehr schnell et, dans les dernières mesures, diminuendo—pp à pppp en quatre mesures) constitua certainement, à ses yeux, un brillant apogée du volume. Die Zigeunerin demeura dans la seconde édition (1898), mais pas Waldmädchen, omis par le compositeur qui avait alors écrit, dans le volume de Mörike, une musique féerique, d’une incomparable délicatesse. Die Kleine ne fut, quant à lui, pas publié du vivant de Wolf, qui sentit manifestement que le texte lubrique était susceptible d’offenser les esprits. L’autre mise en musique d’un poème d’Eichendorff réalisée en 1887, Nachtzauber, est marquée sanft fliessend et imprégnée de cet enchante­ment romantique qui avait tant attiré Schumann. Tout le lied s’écoule de manière hypnotique, avec un accompagnement oscillant qui semble presque anticiper Debussy. Nachtzauber, écrit le 24 mai, fut pratiquement la dernière oeuvre composée par Wolf cette année-là. La mort de son père, une quinzaine de jours auparavant, le plongea dans une sorte de paralysie de la créativité, rompue seulement l’année suivante, avec la stupéfiante éruption des Mörike-Lieder, jaillis de sa plume entre le 22 février et le 18 mai. Wolf décida alors de différer leur achèvement pour terminer le volume d’Eichendorff entrepris, comme nous l’avons vu, en 1880, avec l’écriture d’Erwartung et de Die Nacht. À nouveau, les compositions se succédèrent à une allure remarquable: treize nouveaux lieder virent le jour entre le 31 août et le 29 septembre, dont pas moins de dix dans la semaine du 22 au 29 septembre. Dans une lettre du 12 mars 1891 adressée à Engelbert Humperdinck, il expliqua clairement que, conformément à la tendance réaliste de l’art («über­einstimmend mit der realistischen Kunst­richtung»), il souhaitait abandonner l’élément romantique de la poésie d’Eichendorff pour se tourner vers le côté relativement méconnu, effrontément humoristique et crûment sensuel du poète («der ziemlich unbekannten, keck humoristischen, derb-sinnlichen Seite des Dichters»). Et le Grosser Lieder-Katalog de Challier nous apprend sans peine qu’il fut le premier compositeur à prêter attention à cette facette de la poésie d’Eichendorff. Ces lieder sont un ravissement. En tête du volume publié, Wolf plaça Der Freund, en hommage aux amis qui l’avaient aidé à couvrir les coûts d’édition (Friedrich Eckstein) et soutenu lors de sa dépression (Edmund Lang et d’autres, comme Joseph et Friedrich Schalk, dédi­cataires du volume). Afin d’expliciter davantage encore sa gratitude envers de tels amis, il fit suivre le lied initial de Der Musikant, sorte d’autoportrait humoristique, doté d’arpèges luthés dans l’accompagnement et d’une délicieuse modulation jusqu’à une tonalité reculée aux mots «Weiss nicht, wo ich abends ruh!», reflet de la crainte que le ménestrel a de passer la nuit sans un toit au-dessus de sa tête. Le lied suivant, Verschwiegene Liebe est, malgré la résolution de Wolf d’épouser le réalisme, le plus romantique et le plus schumannesque du volume. Eichendorff composa ce poème en 1855, puis l’incorpora à sa narration en vers Robert und Guiscard, où Guiscard—à sa fenêtre ouverte, humant, par un clair de lune, le parfum de lilas et sentant Marie, son amour, toute proche—le chante «des tréfonds de son cœur». «Errät’ es nur Eine, Wer an sie gedacht» se réfère clairement à Marie, mais Wolf songeait probablement à Melanie Köchert, dont il était déjà émotionnellement, et clandestinement, épris. Selon le premier biographe de Wolf, Ernst Decsey, ce lied fut composé d’une seule traite. Un livre de poèmes d’Eichendorff à la main, Wolf déambulait dans le jardin de Friedrich Eckstein et s’immergeait dans l’atmosphère du poème, lorsque, incapable de supporter le bruit de l’usine voisine, dérangé par des sifflements dans la cour et gêné par le claquement persistant de tapis battus, dans une autre maison, il s’en retourna, monta dans la chambre d’Eckstein, s’assit au piano, posa le livre de poèmes et écrivit tout le lied sans presque prendre le temps de respirer. Das Ständchen est une sérénade complètement à part. Son titre fait allusion à la chanson fredonnée par un jeune étudiant à la porte de sa bien-aimée, mais nous n’entendons cette sérénade que sous la forme d’un accompagnement luthé dans la partie de piano, lorsque des fragments de mélodies et des notes en pizzicato sont exécutés par la main droite. Dolce, la marque cruciale du lied, est à l’image du jeune étudiant, heureux et amoureux, mais détonne avec les tristes énonciations dans la ligne vocale du vieil homme, éperdu de douleur au souvenir de son bonheur avant la mort de sa bien-aimée. Il chante une sorte de récitatif, souvent sur des notes répétées, qui ne cristallise jamais vraiment en lied, rendant encore plus poignant le contraste avec le jeune homme sérénadant, allègre; le récitatif ne cristallise jamais, du moins jusqu’à «So in meinen jungen Tagen», lorsque la ligne vocale remémore, de manière déchirante, l’accompagnement de type luth, rappelant au vieil homme son bonheur passé—un moment inoubliable, qui point le cœur. Der Soldat I, Der Soldat II, Die Zigeunerin et Nachtzauber, déjà évoqués, suivent ce chef-d’œuvre et précèdent deux lieder picaresques, composés à trois jours d’intervalle: Der Schreckenberger et Der Glücksritter, caractérisés par une énergie rythmique et un panache immense. Wolf les conçut, de toute évidence, comme une paire, le thème processionnel situé à la fin du premier lied, et marqué pompös et fff, étant repris dans le postlude du second. Der Schreckenberger, qui parut dans la Novelle d’Eichendorff Der Glücksritter, fut inspiré par la nature sauvage de la région de Rettenbach, aux environs d’Ischl; quant à Der Glücksritter, Wolf en conçut le manuscrit dans une malle-poste qui le conduisait à Rinnbach. La créativité exacerbée de Wolf est également manifeste dans les deux lieder suivants, composés le 29 septembre. Lieber alles passe en revue la possibilité de devenir soldat, étudiant ou poète, mais rejette toutes ces professions tour à tour, le poète voulant combiner les trois—d’où le titre, qui affirme qu’il voudrait «plutôt tout». Aussi se met-il en route, une solide épée au côté, un luth dans la main droite, et un coeur d’étudiant prêt à se battre en duel avec n’importe qui. Wolf illustre la nature donquichottesque du jeune homme par une succession rapide de motifs différents, dans le prélude, et traduit son dégoût de chaque profession par des moyens musicaux intelligents: la mention du métier de soldat est ponctuée par une pause; le chanteur doit ralentir («zurückhaltend») pour décrire l’étude; quant au pianiste, il se voit octroyer une succession de demi-tons stridulants, pépiant avec incompétence, manière de dépeindre la pruderie de l’écriture poétique. Heimweh, avec son rythme allègre, sa mélodie harmonieuse et sa merveilleuse mise en musique du mot «weit» (sur un mélisme lié, sur une mesure et demie, pour montrer combien sa bien-aimée et sa patrie sont lointaines) a toujours été l’un des Eichendorff-Lieder les plus populaires de Wolf, mais pas toujours pour les bonnes raisons. Lors d’une des premières exécutions des Eichendorff-Lieder, le 7 février 1889, Wolf accompagnait Ferdinand Jäger dans une interprétation de Heimweh, dans le Wagner-Verein, lorsque, après la phrase «Grüss dich, Deutschland, aus Herzensgrund!», un tonnerre d’applaudisse­ments secoua les rangs des «Grossdeutschen», couvrant le postlude. Furieux, Wolf referma dans un claquement le couvercle de son piano et cria, d’un ton venimeux, au public fautif: «Und das im Wagner-Verein!» («Et ça dans le Wagner-Verein!»). Le concert fut interrompu et les «Grossdeutschen» sortirent. Le même vers suscita une autre anecdote amusante, survenue à Wiesbaden, lors d’un récital de lieder réunissant Alfred Brendel et Hermann Prey—lequel rapporte ces faits dans sa Premierenfieber. À l’entracte, Alfred Brendel, qui ne s’était pas pris de sympathie pour le public, plutôt conservateur, offrit cinquante marks au chanteur s’il osait changer le dernier vers de Heimweh en «Grüss dich, Sarah, aus Herzensgrund!». Prey ne releva pas le défi. Les deux lieder suivants sont chantés par un étudiant—heureux dans Der Scholar, désespéré dans Der verzweifelte Liebhaber. Le premier lieder, l’un des plus délicieux de Wolf, voit l’étudiant ravi de tout ce qu’il fait: écouter les oiseaux, le crépitement de la pluie ou les éclairs. Rien, dit-il, ne pourrait le détourner du Wandern. Affranchi de Mammon, il parcourra les champs de la connaissance, réfléchira profondément et boira, à l’occasion, un ou deux verres de vin. Et, lorsqu’il sera fatigué de pareille étude, il donnera la sérénade à sa bien-aimée. Et tandis que la mémorable mélodie de Wolf pour la voix et la main droite véhicule cette existence sybarite, la main gauche énonce une autre interprétation du texte. Les croches sont jouées staccato tout au long de la première strophe, probablement en réponse aux gouttes de pluie, puis legato dans la deuxième strophe, pour traduire l’idée d’un «zufriedenes Gemüt», d’un cœur content. Les croches reviennent avec l’excitante idée de l’alcool mais, à «Rebensaft»—autrement dit, une fois le vin lampé—, le pianiste doit jouer nicht stacc.—l’effet adoucissant du vin s’est déjà fait sentir! La dernière strophe, qui s’ouvre sur une description de la fatigue née de ce travail, n’a pas non plus besoin de croches staccato—jusqu’à ce que l’étudiant décide de pincer les cordes pour donner la sérénade à sa bien-aimée. Ce poème figure au chapite VI de la nouvelle d’Eichendorff Dichter und ihre Gesellen, lorsque le héros, Fortunat, entend une troupe de ménestrels, surpris par un orage, chanter les deux premières strophes—la même troupe chantant les troisième et quatrième strophes après avoir trouvé refuge en ville. L’étudiant de Der verzweifelte Liebhaber exprime son désespoir dans une succession de phrases récitatives, interrompues par des accords âpres: l’étude ne lui rapporte rien, son manteau est décousu, sa cithare est cassée et sa bien-aimée ne l’aime pas. Il se met alors à fantasmer, les croches commencent à s’écouler, et il s’imagine, parcourant une prairie au bras de la plus superbe des jeunes femmes. La musique se poursuit dans une autoparodie ironique: déguisé en dragon (octaves de croches), il emmène la dame et, muni d’une armure et d’une lance, met en déroute tous les philistins avant de s’allonger sous les cieux, satisfait (blanches pointées jouées piano). Unfall—peut-être une burlesque de Dans un bois solitaire de Mozart—raconte comment le narrateur, en promenade dans la campagne, rencontre un garçonnet, un fusil à la main. Arrivé devant l’homme, le petit coquin (Cupidon déguisé) lui tire dessus. Tombé face contre terre, le narrateur découvre l’identité de son assaillant et se met, outré, dans une profonde colère. Ce petit poème est un véhicule idéal de la vivacité d’esprit wolfienne. La narration pince-sans-rire s’ouvre en ré mineur «tragique», avec des phrases carrées, jusqu’à ce que le narrateur commence à courir (les croches deviennent des triolets de doubles croches) vers son agresseur, lequel fait feu sur l’accompagnement d’un accord de septième dissonant sforzando. Au moment de la chute, la ligne vocale devient fragmentée, et Cupidon rit de sa victime dans une rafale de triolets de doubles croches. Liebesglück (ce poème est intitulé Der Glückliche chez Eichendorff) dépeint le ravissement qui emplit le cœur d’un amoureux lorsque sa bien-aimée pose les yeux sur lui. Exubérant et rythmiquement vigoureux, ce lied requiert, outre un chanteur doué d’un contrôle du souffle et d’une endurance considérables, un pianiste qui ne fléchit pas sous la pression du martèlement du rythme dactylique dans les deux mains. Le recueil s’achève sur un adieu, Seemanns Abschied, qui permet à Wolf de manifester son don pour les touches picturales—tels les vagues brisantes (octaves de basses), le claquement des mâchoires de requin, le cri des mouettes—et sa remarquable capacité à évoquer une atmosphère. Nous sommes devant un paysage marin qui empeste les relents et les embruns, qui évoque les vents cinglants, comme nous pouvons l’entendre dans la toute première mesure du tumultueux prélude, face auquel Bruckner s’écria, complètement stupéfait, lorsque Wolf lui montra son lied: «Teufel! woher haben Sie den Akkord!» («Diantre! D’où avez-vous tiré cet accord!»). Die Lieder von Wolf gehören zu dem Ungereimtesten, das die äußerste Linke der neudeutschen Schule wohl bisher gezeitigt haben mag, und haben nach meinem Begriffe der Tonkunst nichts weiter mit ihr gemein, als etwa das Elementare des Klanges und des Rhythmus. Joseph, Freiherr von Eichendorff zählte schon immer zu Wolfs Lieblingsdichtern. In der Wiener Stadtbibliothek findet sich ein wohl aus dem Jahre 1878, als Wolf achtzehn war, datierendes Titelblatt, welches die drei Romanzen von J von Eichendorff (Der Kehraus, Das zerbrochene Ringlein und Der traurige Jäger) auflistet, von denen keine einzige überlebte. Zu anderen frühen Vertonungen seiner Dichtung zählt ein Entwurf zu Verschwiegene Liebe von 1879, dessen Vokallinie nichts mit der gefeierten zweiten Fassung gemein hat; sowie ab 1880 die drei Lieder Erwartung, Die Nacht und Nachruf, von welchen die ersten beiden zu den ursprünglichen Eichendorff-Liedern gehörten, aber aus der zweiten Ausgabe gestrichen wurden. Ersterer Entwurf, der als einfach und herzlich gekennzeichnet war, ist vielleicht das attraktivste Werk aus Wolfs Jugendwerk; die abfallenden Terzen, die die Singstimme begleiten, befinden sich im Einklang mit der vom Gedicht ausgedehnten Stimmung sanfter Erwartung, und wenn auch die Harmoniestruktur ganz unmißverständlich in der Tradition Brahms’ zu finden ist, vor allem im triumphierenden Nachspiel, so sind die Inflexionen in der Vokallinie typisch für Wolf. Auch Die Nacht, mit ihrer hypnotischen Begleitung, bietet einen Vorgeschmack auf Wolfs spätere Meisterleistungen mit Liedern wie Nachtzauber, aber offensichtlich stand er bei Schumann in der Schuld, vor allem mit dem Vorspiel in der Art von Zwielicht; und dies mag vielleicht der Grund dafür sein, daß er das Lied in der zweiten Ausgabe des Eichendorff-Liederbuches nicht verwendete—er hatte letztendlich „zu sehr wie Schumann“ über die unvollendete Partitur eines frühen Chamisso-Liedes von 1878 gekritzelt! Das nächste Mal wandte sich Wolf der Dichtung Eichendorffs im April 1881 zu, als er inmitten seiner Trennung von Vally Franck die sechs herrlichen Geist­lichen Lieder zu Gedichten komponierte, die sich mit dem Tod, dem Abschied und der Ergebung in den Willen Gottes beschäftigen, darunter Resignation („Komm, Trost der Welt, du stille Nacht“), das Schumann so wundervoll in Der Einsiedler verarbeitet hatte. Im Sommer des selben Jahres schrieb Wolf In der Fremde I („Da fahr’ ich still im Wagen“), das erste von drei Liedern mit dem selben Titel, und gleichzeitig das einzige, das er als ein sich durch­schlagender Kapellmeister in Salzburg in jenem düsteren Jahr vollbrachte, welches er in Daten aus meinem Leben als „Bruch. Elend. Jammer“ beschrieb. Auch hier zeigt sich der Einfluß Schumanns ganz deutlich. Mit In der Fremde II 5 begann er im Februar 1882 und stellte es 1883 fertig, in einem Jahr, das die Komposition von fünf Liedern sah, darunter In der Fremde III und Rückkehr. Die Thematik all dieser Lieder ist uns allen aus Schumanns gefeiertem Eichendorff-Liederkreis, op. 39, bekannt: die Isolation und Einsamkeit des nach Hause kehrenden Wandersmann, den keiner mehr kennt. Zu diesem frühen Zeitpunkt seiner Künstlerkarriere konnte Wolf der Versuchung noch nicht widerstehen, jenen Typ von Eichendorff-Gedichten auszuwählen, den Schumann bereits so erstaunlich und eindrucksvoll verarbeitet hatte. Das Ergebnis ist jedoch kaum befriedigend, denn alle drei Gedichte sind in ihrer Notenlinie nahezu identisch mit den beiden Liedern In der Fremde von Schumann. Wolfs Musik schafft es trotz herrlicher Detailtreue nicht, eine eigene Form anzunehmen und zu überzeugen. Es ist daher auch nicht überraschend, daß er, nachdem er sich 1888 dazu entschloß, einen vollständigen Eichendorff-Zyklus zu komponieren, den Themen der Nostalgie und Einsamkeit den Rücken kehrte und sich statt dessen auf die pikareske Galerie von Soldaten, Studenten, Seeleuten und Spielmännern konzentrierte, die bis dahin von allen Liedkomponisten der Dichtung Eichendorffs vernach­lässigt wurden. 1888 war aber noch vier Jahre entfernt. Nach der Fertigstellung von In der Fremde III (30. Januar 1883) folgte ein bracher Zeitabschnitt von fast viereinhalb Jahren, die im Februar 1883 mit dem Tode seines Vorbildes Wagner sowie der Ablehnung einer Lieder­sammlung seitens Breitkopf & Härtel ihren Anfang nahmen. Dies deprimierte ihn zutiefst, und er war gezwungen, sich recht und schlecht als Musikkritiker durch­zuschlagen, womit ihm wenig Zeit zum Komponieren blieb. Während dieser vier kargen Jahre kamen lediglich drei Lieder zustande, darunter Der Soldat II (14. Dezember 1886), eine theatralische Glanzleistung, die eine carpe-diem-Einstellung zum Leben propagiert und den näherrückenden Tod in einer Folge von sich wiederholenden, düster geflüsterten Phrasen darstellt, während sich das Lied—Wolfs kürzestes?—einem verhängnis­vollen Abschluß entgegen­quält. Im Vorspiel hört man Ambosse aus den Nibelungen, und insgesamt erinnert die gesamte Atmosphäre des Liedes an Wagner. Und dennoch steht dieses Lied vom Gefühl her durch und durch in der Tradition Wolfs—ein wunderbares Beispiel dafür, was ein großartiges Lied alles erreichen kann—in diesem Falle die Kürzung einer Opernidee auf ihr Wesentliches; insgesamt ein Vorgeschmack auf all das Erstaunliche, das uns noch erwartete. Die fünf Lieder, die er zwischen März und Mai 1887 zu Eichendorff-Texten komponierte, sind alle von der selben hohen künstlerischen Klasse, und wieder erahnen wir etwas von dem Genius, der sich in Liedform entfalten sollte. In Der Soldat I, das Wolf am 7. März komponierte, ist er ganz klar von dem tänzelnden Pferdchen fasziniert, das ihn zum Schloß seiner Geliebten bringt, und als diese zu besitzergreifend und anspruchsvoll wird, ihn wieder hinaus ins weite Land und in die Freiheit befördert. Dabei spielt Eichendorff mit der Doppeldeutigkeit des Wortes „Freien“: einerseits „um die Hand anhalten“, andererseits „draußen im Freien“. Genau ein Jahr darauf, am 7. März 1888, schuf Wolf ein weiteres tänzelndes Motiv mit Mörikes Der Gärtner. Es ist erstaunlich, wie das kleine Motiv im Eichendorff-Lied raffinierten Wechseln unterzogen wird: Staccato und selbstbewußt zu Beginn, munter und zart bei „Die mir besser gefällt“, und zum Ende schließlich robust und arrogant, als er seinen liebenden Schatz verläßt. Es gibt eine verblüffende Ähnlichkeit zwischen dieser Musik und Wolfs Italienischer Serenade für Streichquartett, die er zwei Monate später komponierte und die ihre Konzeption ebenfalls Eichendorff verdankt, dessen Novelle Aus dem Leben eines Taugenichts nicht nur eine italienische Serenade enthält, sondern auch ein Gedicht mit dem Titel Wer in die Fremde will wandern, welches Wolf 1888 als Heimweh verarbeitete. Nach der Fertigstellung von Der Soldat I, bearbeitete Wolf drei Gedichte Eichendorffs, Die Kleine (8. März 1887), Die Zigeunerin (19. März) und Waldmädchen (20. April), die sich alle mit der Darstellung der Frau als unabhängige Person beschäftigen, die ihr Schicksal selbst in der Hand hat. Die Zigeunerin war mit ihren herrlich koketten, melismatischen Triolen Teil der ersten Ausgabe der Eichendorff-Lieder, die Wolf mit Waldmädchen enden ließ. Ihr virtuoses, mit sehr schnell gekennzeichnetes Nachspiel, das in den Schlußtakten zu diminuendo wird (pp bis pppp innerhalb von vier Takten), betrachtete er wohl als einen brillanten Höhepunkt seiner Zusammenstellung. Die Zigeunerin erscheint auch in der zweiten Auflage von 1898, wohingegen Waldmädchen weggelassen wurde. Wolf hatte bereits zu diesem Zeitpunkt für die Mörike-Sammlung feenartige Musik unvergleichlicher Feinheit geschrieben. Die Kleine wurde erst nach dem Tode Wolfs veröffentlicht, da er davon überzeugt war, daß der schlüpfrige Text als anstößig aufgefaßt werden könnte. Die andere Eichendorff-Bearbeitung von 1887 ist Nachtzauber, das als sanft fließend gekennzeichnet ist und in jenen romantischen Zauber eintaucht, von dem Schumann so begeistert war. Das ganze Lied fließt mit einer sich wiegenden Begleitung hypnotisch dahin, so daß man fast schon Debussy erahnen könnte. Nachtzauber, am 24. Mai geschrieben, war praktisch das letzte von Wolf in jenem Jahr komponierte Werk. Zwei Wochen zuvor verstarb sein Vater und er verfiel in eine künstlerische Starre, die sich erst im folgenden Jahr mit dem erstaunlichen Erguß an Mörike-Liedern, die ihm zwischen dem 22. Februar und 18. Mai aus der Feder flossen, lösen sollte. Er entschloß sich dann, die Vervollständigung der Mörike-Lieder zu verschieben und statt dessen die Eichendorff-Sammlung, die er, wie wir bereits wissen, 1880 mit den Kompositionen Erwartung und Die Nacht begann. Das Tempo seiner Kompositionen war wieder einmal beachtlich. In kurzer Folge schrieb er zwischen dem 31. August und dem 29. September dreizehn neue Lieder, und nicht weniger als zehn in der Woche vom 22. zum 29. September. In einem Brief an Engelbert Humperdinck vom 12. März 1891 stellte er klar, daß er „übereinstimmend mit der realistischen Kunstrichtung“ beabsichtigte, das romantische Element der Dichtung Eichendorffs abzulegen und sich statt dessen der ziemlich unbekannten, keck humoristischen, derb-sinnlichen Seite des Dichters zuzuwenden. Und ein Blick in Challiers Grossen Lieder-Katalog zeigt uns, daß er der erste Liederkomponist war, der sich mit diesem Aspekt der Dichtung Eichendorffs befaßte. Die Lieder sind ein wahres Vergnügen. An den Anfang der veröffentlichten Sammlung setzte er Der Freund, eine Würdigung an seine Freunde, die ihm beim Tragen der Kosten der Veröffentlichung halfen (Friedrich Eckstein), und ihn während seiner depressiven Phase beiseite gestanden haben (Edmund Lang, Joseph und Friedrich Schalk und andere, denen diese Sammlung gewidmet wurde). Um seine Verpflichtung diesen Freunden gegenüber noch deutlicher zu machen, brachte er gleich nach dem Eröffnungslied das Lied mit dem Titel Der Musikant, eine Art humorvolles Selbstporträt mit einem Lauten-Arpeggio in der Begleitung sowie einer herrlichen Modulation zu einer entfernten Tonart bei „Weiss nicht, wo ich abends ruh!“, womit die Sorge des Spielmanns ausgedrückt wird, der nicht weiß, ob er die Nacht ein Dach über dem Kopf haben wird. Als nächstes kommt Verschwiegene Liebe, das trotz Wolfs Beschluß, für den Realismus einzutreten, das romantischste Lied à la Schumann in dieser Sammlung ist. Das Gedicht dazu datiert aus dem Jahr 1855; Eichendorff schloß es später in seine Erzählung in Versform Robert und Guiscard ein, wo es von Guiscard gesungen wird, der bei Mondschein an seinem offenen Fenster steht, tief den Duft des Flieders einatmet, die Nähe seiner geliebten Marie spürt und das Lied „aus der Tiefe seines Herzens singt“. „Errät’ es nur Eine, Wer an sie gedacht“ bezieht sich ganz klar auf Marie, Wolf dachte dabei jedoch wohl an Melanie Köchert, zu der er bereits ein heimliches emotionales Verhältnis unterhielt. Das erste Lied entstand laut Wolfs erster, von Ernst Decsey verfaßter Biographie in einem einzigen Erguß an Inspiration. Wolf wanderte im Garten Friedrich Ecksteins mit einem Gedichtband Eichendorffs auf und ab, und versank in der Stimmung des Gedichtes. Doch er konnte den Lärm einer nahegelegenen Fabrik nicht ertragen, ebensowenig wie pfeifende Leute im Hof oder das andauernde Teppichklopfen aus einem weiteren Haus. Er drehte sich um, ging ins Haus, hinauf in Ecksteins Zimmer, legte den Gedichtband beiseite und setzte sich ans Klavier, wo er das komplette Lied mit kaum einer Atempause komponierte. Das Ständchen ist eine unvergleichliche Serenade. Der Titel bezieht sich auf ein von einem jungen Studenten vor der Bleibe seiner Geliebten dargebrachtes Liedchen, wir aber hören seine Serenade nur während der Klavierpartie in Form einer Begleitung durch die Laute, die rechtshändig ein paar Takte der Melodie sowie einige Pizzicato-Noten spielt. Die Kennzeichnung mit dolce ist von entscheidender Bedeutung, denn der junge Student ist glücklich und verliebt. Dies steht im Gegensatz zu den traurigen Klängen in der Vokallinie des alten Mannes, der verzweifelt zuschaut, und an die Glückseligkeit erinnert wird, die er erleben durfte, bevor seine Geliebte starb. Er singt in einem rezitativen Stil, oft mit sich wiederholenden Noten, die sich nie richtig zu einem Lied verquicken, so daß der Kontrast zum fröhlichen Ständchensänger noch schmerzlicher wird. Niemals, bis zur Stelle „So in meinen jungen Tagen“, als nämlich die Vokallinie auf herzensbrecherische Weise die lautenartige Begleitung erwidert, und den alten Mann an eigene vergangene Freuden erinnert—ein unvergeßlicher Moment, der ans Herz geht. Das Meisterwerk wird gefolgt von Der Soldat I, Der Soldat II, Die Zigeunerin und Nachtzauber, die bereits eingehend behandelt wurden. Zwei verwegene Lieder, die er in nur drei Tagen Abstand voneinander komponierte, folgen als nächstes: Der Schreckenberger und Der Glücksritter, die sich durch rhythmische Energie und enormen Elan auszeichnen. Wolf schuf sie beide offensichtlich als Paar, da das als pompös und fff gekennzeichnete, gegen Ende der ersten Vertonung auftretende Prozessionsthema im Nachspiel der zweiten wiederkehrt. Der Schreckenberger, der in Eichendorffs Novelle Der Glücksritter in Erscheinung tritt, wurde durch die Wildheit der Region Rettenbach rund um Ischl inspiriert. Wolf entwarf den Glücksritter übrigens auf einer Postkutschenfahrt nach Rinnbach. Wolfs gesteigerte Kreativität erkennt man auch in den nächsten beiden Liedern, die er am selben Tag, den 29. September, schrieb. Lieber alles beschäftigt sich mit der Frage, Soldat, Student oder Dichter zu werden. Nach und nach lehnt er dabei jede Alternative ab, denn er möchte die Elemente aller drei miteinander verbinden—daher auch der Titel. Und so macht er sich mit seinem Pferd auf den Weg, mit einem kräftigem Schwert an seiner Seite, der Laute in seiner Rechten und in der Brust das Herz eines Studenten, der es im Duell mit jedem aufnehmen würde. Wolf veranschaulicht im Vorspiel in rasch aufeinanderfolgenden, verschiedenen Themen die ritterliche Natur des jungen Mannes, und zeigt sein Mißfallen an den jeweiligen Professionen anhand von cleveren musikalischen Mitteln. Die Erwähnung des Soldaten wird unterbrochen von einer Pause; der Sänger wird zur Zurückhaltung angewiesen, als er das Studium beschreibt; und um die Zimperlichkeit des Dichters darzustellen, intoniert der Pianist eine Folge von piepsenden Halbtönen, die wirkungslos davonzwitschern. Heimweh war, mit seinem Wanderrhythmus und seiner herrlich melodischen Vertonung des Wortes „weit“ (die mit einer gebunden Melisma über anderthalb Takte hinweg veranschaulicht, wie weit seine Geliebte und seine Heimat entfernt sind), schon immer eine von Wolfs liebsten Eichendorff-Vertonungen gewesen, jedoch nicht immer aus dem richtigen Grund. Bei einer der ersten Aufführungen der Eichendorff-Lieder im Wagner-Verein am 7. Februar 1889 begleitete Wolf Ferdinand Jäger zu einer Inszenierung von Heimweh, als nach dem Satz „Grüss dich, Deutschland, aus Herzensgrund!“ ein tosender Applaus unter den anwesenden „Groß­deutschen“ ausbrach, worin das Nachspiel völlig unterging. Wolf war wütend, er schlug den Klavierdeckel zu und schrie haßerfüllt ins entsetzte Publikum: „Und das im Wagner-Verein!“ Das Konzert wurde unterbrochen und die „Großdeutschen“ verließen den Saal. Zur selben heiklen Zeile gibt es eine weitere amüsante Anekdote, wie sich Hermann Prey in Premierenfieber entsinnt. Während einer Pause bei einem Liederabend mit Alfred Brendel in Wiesbaden bot ihm Brendel, der sich noch nicht mit dem Publikum erwärmen konnte, fünfzig Mark dafür, daß er die letzte Zeile von Heimweh in „Grüss dich, Sarah, aus Herzensgrund!“ ändern würde. Prey lehnte diese Herausforderung aber ab. Die nächsten beiden Lieder werden von einem Studenten gesungen—zufrieden in Der Scholar, hoffnungslos in Der verzweifelte Liebhaber. Ersteres stellt eines der herrlichsten Lieder Wolfs dar. Der fragliche Student ist glücklich bei allem das er tut; den Vögeln zuzuhören, dem Platschen des Regens oder einem Gewitter. Nichts, so sagt er, könne ihn vom Umherziehen abhalten. Frei vom schnöden Mammon durchstreift er die Felder des Wissens, in Gedanken vertieft, und trinkt auch mal ein Gläschen Wein oder zwei. Und wenn er des Studierens müde ist, so bringt er seiner Geliebten ein Ständchen dar. Und während sein genußsüchtiges Dasein durch Wolfs unvergeßliche Melodie für Stimme und rechte Hand vermittelt wird, so ist die linke Hand mit einer völlig anderen Interpretation des Textes beschäftigt. Die Achtelnoten werden während des ersten Verses durchgehend staccato gespielt, was zweifelsohne durch die Erwähnung der Regentropfen angeregt wurde; im zweiten Vers erscheinen sie dann legato („gebunden“), um das „zufriedenes Gemüt“ auszudrücken. Sie kehren zur anregenden Idee des Alkohols zurück, doch bei „Rebensaft“ ist der abklärende Effekt des Weines bereits zu spüren, mit anderen Worten, nachdem der Wein getrunken wurde, wird der Pianist angewiesen nicht stacc. zu spielen. Der letzte Vers, der mit einer Schilderung des Ermüdenden der Arbeit beginnt, benötigt ebensowenig Achtelnoten in Staccato—bis er sich zu einem Ständchen für seine Liebste entschließt und beginnt die Saiten zu zupfen. Das Gedicht erscheint in Eichendorffs Novelle Dichter und ihre Gesellen, in der im sechsten Kapitel der Held Fortunat die ersten beiden Verse von einer Gruppe fahrender Musikanten dargeboten bekommt, die von einem Gewitter überrascht worden sind; die Verse drei und vier werden gesungen, als sie Unterschlupf in einer Stadt gefunden haben. Der Student in Der verzweifelte Liebhaber drückt sein Verzagen in einer Folge von rezitativen Phrasen aus, die durch schroffe Akkorde unterbrochen werden: das Studieren bringt ihm nichts ein, sein Mantel hat Risse, seine Zither ist kaputt und seine Liebste liebt ihn nicht. Dann fängt er an zu phantasieren, die Achtelnoten beginnen zu fließen und er stellt sich vor, wie er mit der allerschönsten der Damen im Arm über eine Wiese spaziert. Die Musik setzt mit einer etwas ironischen Selbstparodie fort: als Drache verkleidet (Oktavachtel­noten) trägt er sie hinweg, und mit Rüstung und Lanze ausgestattet schlägt er all die Banausen in die Flucht und legt sich schließlich zufrieden unter freiem Himmel nieder (punktierte Halbnoten in piano). Bei Unfall, das eventuell eine Burleske zu Mozarts Dans un bois solitaire darstellt, erfahren wir, wie der Erzähler während eines Spaziergangs übers Land einen Jungen mit einem Gewehr in der Hand antrifft. Als er den Knaben zur Rede stellt, feuert dieser Racker (ein maskierter Cupido) auf ihn, so daß er zu Boden geht. Nachdem der Erzähler die Identität seines Attentäters erkennt, steigt seine Empörung und Verärgerung noch weiter. Dies kleine Gedicht ist ein idealer Träger für den Wolf’schen Geist, mit dem uns der Komponist überhäuft. Die trockene Erzählung beginnt in einem „tragischen“ d-Moll mit kantigen Phrasen, bis der Erzähler auf seinen Angreifer hinzuzulaufen beginnt (Achtelnoten werden zu Sechzehnteltriolen), der den Schuß in Begleitung eines stark hervorgehobenen, dissonanten siebten Akkords abgibt. Als er zu Boden geht, bricht die Vokallinie aus­einander und Cupido lacht ihn in einem Guß aus Sechzehn­teltriolen aus. Liebesglück (bei Eichendorff heißt das Gedicht Der Glückliche) beschreibt die Verzückung, von der das Herz eines Verliebten erfüllt ist, sobald ihn seine Liebste anblickt. Dieses überschweng­liche und rhythmisch so dynamische Lied verlangt nach einem Sänger mit außerordentlicher Atemtechnik und Ausdauer sowie einen Pianisten, der nicht müde wird, daktylischen Rhythmus mit beiden Händen zu hämmern. Die Sammlung schließt mit einem Abschiedslied, Seemanns Abschied, einem weiteren Lied, das Wolf die Gelegenheit gibt, sein Talent für bildhafte Darstellungen auszuüben, so zum Beispiel bei den peitschenden Wellen (Baßoktaven), dem Schnappen der Haie, oder dem Kreischen der Möwen, sowie seine beachtliche Fähigkeit Atmosphäre zu erzeugen. Wir erleben hier im allerersten Takt dieses tosenden Vorspiels eine Meereslandschaft mit dem strengen Geruch der Gischt und dem Duft des peitschenden Windes, was Bruckner, als Wolf ihm das Lied zeigte, zu einem Ausruf der Verwunderung veranlaßte: „Teufel! woher haben Sie den Akkord!“. Joseph, Freiherr von Eichendorff wurde 1788 auf Schloß Lubowitz in Schlesien, dem Landsitz seiner Familie, geboren. Dort verbrachte er auch seine Kindheit, umgeben von idyllischen, waldreichen Bergen hoch über dem Odertal. Er wurde zunächst von Privatlehrern unterrichtet und besuchte dann eine katholische Schule in Breslau, die er 1805 verließ, um zusammen mit seinem ergebenen Bruder an der Universität von Halle Jura zu studieren. 1807 zog er nach Heidelberg, wo er stark den Einfluß von Arnim und Brentanos Des Knaben Wunderhorn spürte, das zwischen 1805 und 1808 veröffentlicht wurde und eine bedeutende Quelle deutscher Volksdichtung der Romantik darstellt. Nachdem die beiden Brüder die Universität verlassen hatten, begaben sie sich auf eine Kavalierstour, die Paris, Nürnberg und Wien umfaßte, bevor sie schließlich nach Hause zurückkehrten, wo sie bei der Verwaltung des im Verfall befindlichen Familiensitz beizutragen. Zu jener Zeit hatte Eichendorff bereits seine ersten Gedichte verfaßt, darunter solche Juwele wie In einem kühlen Grunde und O Täler weit, o Höhen’, die bald in sämtlichen Anthologien der deutschen Dichtung zu finden waren. Während der Arbeiten auf dem Familienlandsitz verliebte er sich in Aloysia von Larisch, der Tochter des benachbarten Grundbesitzers, die später auch zu seiner Frau wurde. Eichendorff besuchte im Jahre 1809 Berlin, wo er Arnim, Brentano und Kleist traf. Und im darauffolgenden Jahr zog er nach Wien, um für seine Beamtenprüfung zu lernen, wobei er auch regen Kontakt zu Friedrich Schlegel pflegte. Mitgerissen vom Aufruf Friedrich Wilhelms an das preußische Volk meldete er sich als Freiwilliger für den Befreiungskrieg und blieb bis zur Niederlage Napoleons im Jahre 1815 in der Armee, jenem Jahr, das die Veröffentlichung seiner ersten Novelle Ahnung und Gegenwart erlebte, ebenso wie seine Hochzeit mit Aloysia, die ihm vier Kinder schenkte und ihm bis zu ihrem Tode im Jahre 1855 treu blieb. Ab 1816 nahm er im Staatsdienst für die nächsten achtundzwanzig Jahre eine Reihe verschiedener Posten ein, bis er schließlich 1844 frühzeitig in den Ruhestand versetzt wurde. Er zog sich nun aus dem öffentlichen Leben zurück und nahm bei der Revolution von 1848 (die er heftig kritisierte) keine Rolle ein; seine Zeit widmete er vornehmlich der Literatur. Als seine Frau erkrankte, zogen sie nach Neisse, wo sie bei der Familie seiner Tochter wohnten. Nach Aloysias Tod begann er seine Memoiren zu schreiben, doch Anfang November 1857 zog er sich eine Erkältung zu, die schließlich zu einer Lungenentzündung führte. Er verstarb am 26. November 1857 gegen fünf Uhr morgens im Schlaf und wurde vier Tage darauf an der Seite seiner Frau beigesetzt. Die Dichtung Eichendorffs hat einen ungewöhnlich musikalischen Grad inne, was wohl der Grund für die erstaunlich vielen Vertonungen ist, die verschiedene Komponisten zu seinen Gedichten verfaßten. Fischer-Dieskau erwähnt in seinem Buch Töne sprechen, Worte klingen, daß in den letzten siebenundsechzig Jahren des neunzehnten Jahrhunderts gut über fünftausend Eichendorff-Vertonungen entstanden. Seine Gedichte sind—im Gegensatz zu jenen Goethes, der eher ein „Augenmensch“ war—mit Anspielungen auf Hörner, Glocken, Lauten, Mandolinen und andere Musik­instrumente garniert. Und kein anderer deutscher Dichter schrieb so viele Gedichte zu Spielleuten, Musikern oder den Geräuschen der Natur wie er. Dabei herrschen zwei Themen vor: die Schönheit der Landschaft sowie der religiöse Glaube. Die Schönheit der göttlichen Schöpfung zeigt sich in der Natur; Eichendorff versuchte in seiner Dichtung—wenn er auch nie wie andere frühe Schriftsteller der Romantik über diese Ideen theorisierte—den menschlichen Geist von der öden Routine des Alltags loszulösen. Viele seiner Gedichte (es gibt über fünfhundert) sind Variationen zu diesen Themen, doch seine Bandbreite ist größer als man für gewöhnlich annimmt. Seine Gedichte ordnete er in acht Bereiche ein: Wanderlieder, Sängerleben, Zeitlieder, Frühling und Liebe, Totenopfer, Geistliche Gedichte, Romanzen sowie Aus dem Spanischen. Und Wolf, mit seinem Faible für pikareske Charakterdarstellungen von Exzentrikern, wählte Gedichte aus all diesen Bereichen mit Ausnahme der Aus dem Spanischen. Eichendorffs „Doppelleben“ als Dichter der Romantik par excellence und als tüchtiger Bürokrat ist eine ebenso unstimmige Verbindung wie bei Kafka, der Versicherung­sangestellter war, oder Keller, der für den Kanton Zürich arbeitete. Seine 1826 veröffentlichte, bekannteste Novelle Aus dem Leben eines Taugenichts kann als Wunschtraum eines gewissenhaften Staatsbeamten interpretiert werden. Viele seiner Gedichte entstanden zudem in Berlin oder Breslau, wo er sich zweifellos nach dem Landleben sehnte, das er so liebte. Doch Eichendorff war sich auch den Schattenseiten des Lebens bewußt, und so drücken viele seiner Gedichte—insbesondere jene, die Schumann für seinen Liederkreis, op. 93 wählte—Furcht vor der Einsamkeit und Mißtrauen gegenüber anderen Menschen aus. Seine traurigsten Gedichte entstanden nach dem Tod seiner jüngsten Tochter Anna, die am 24. März 1832 im Alter von nur siebzehn Monaten starb. Diese erschütternde Erfahrung ließ ihn einen Zyklus von zehn Gedichten schaffen, den er Auf meines Kindes Tod betitelte. Othmar Schoeck verwendete Von fern die Uhren schlagen als Teil seines Opus 20, und Aribert Reimann ließ sein Nachtstück II (1978) mit Was ist mir denn so wehe? enden. Im großen und ganzen wurden diese wunderbaren Gedichte, deren Stimmung von Verbitterung über Traurigkeit bis zur Akzeptanz übergeht, und schließlich sogar einen leichten Hoffnungsschimmer ausstrahlt, von den meisten Liederkomponisten leider vernachlässigt.